Provide online shoppers with the visual style guidance they experience in stores. Use Curations to showcase how the products look in the real world. Visitors who engage with the visual content are more than twice as likely to convert and spend significantly more. DSW, a retail chain known for its wide selection of brand-name & designer shoes & accessories, faced a challenge common in the retail space — how to give online shoppers the confidence to purchase. Our customers have been asking for more on-the-foot photography, more style guidance, more ‘how to wear’ kind of content, says Alison Wagner, Digital Product Specialist at DSW. The answer to this customer demand? Visual consumer-generated content (CGC). A website redesign presented a prime opportunity to improve the customer experience by placing CGC at the center of their digital strategy. 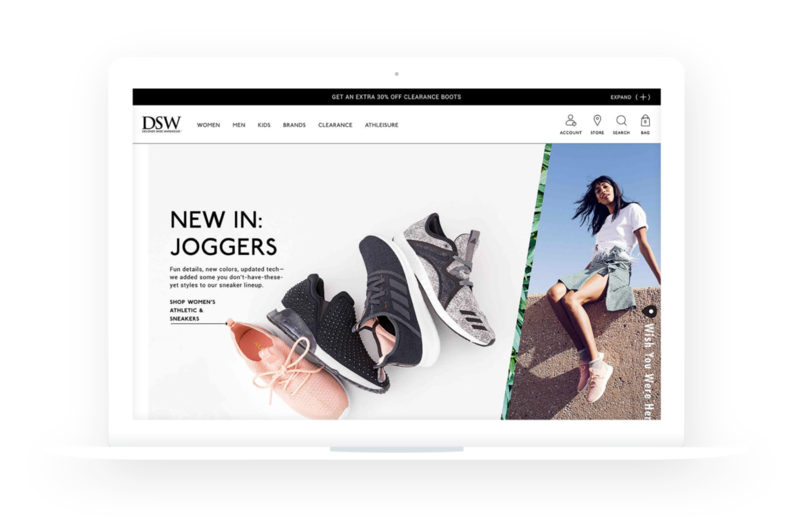 DSW implemented Bazaarvoice Curations to collect and display consumer-generated images from a variety of social platforms on their homepage, product pages and some brand-level pages. Curations powers an engaging visual experience that showcases products in the real world. DSW shoppers can now find their ‘how-to-wear’ inspiration by seeing a pair of shoes styled in a variety of real-life settings. 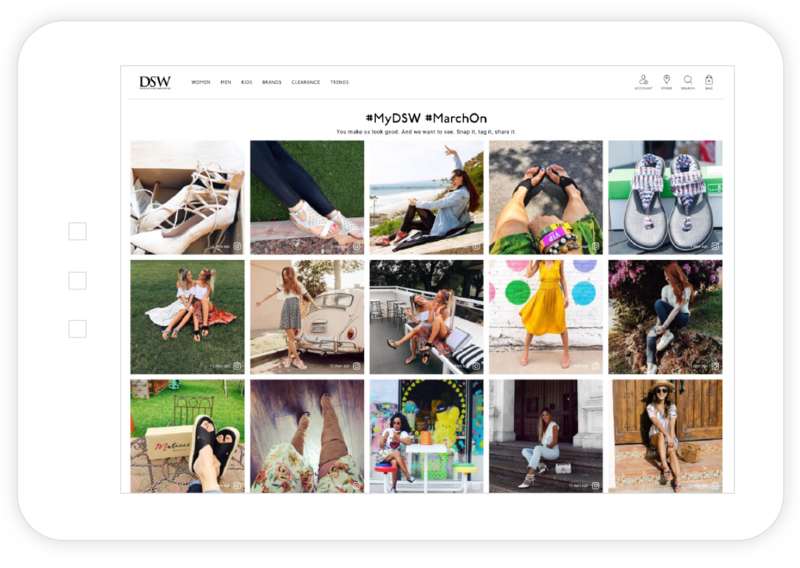 Within the first six months after launching Curations, a majority of DSW site visitors engaged with visual content. Shoppers who did so were more than twice as likely to purchase than those who did not, and spent substantially more money per order. DSW weaves Curations and social sharing into its omnichannel strategy. 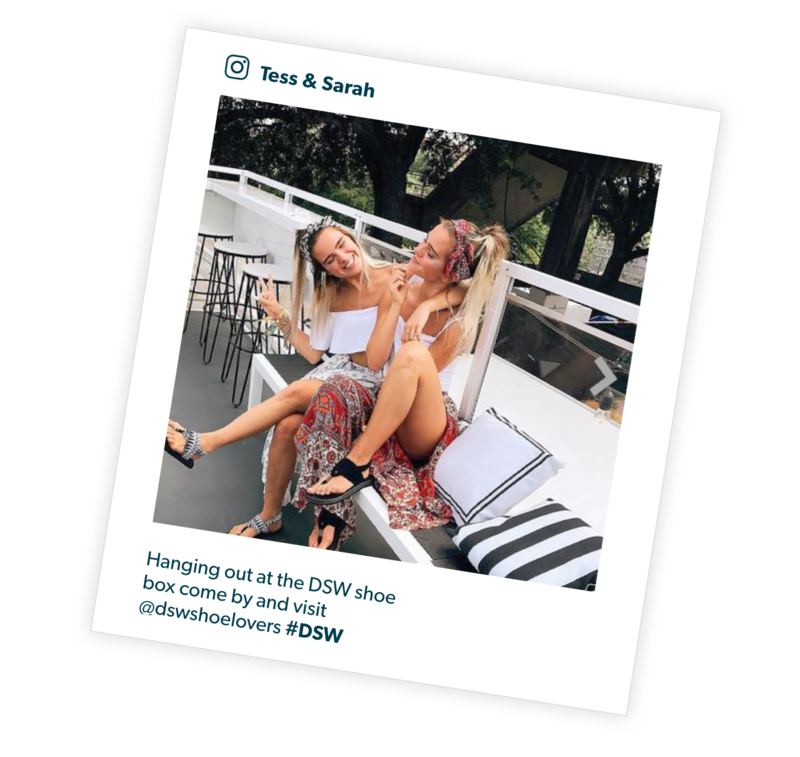 DSW uses the hashtag #MyDSW across multiple customer touchpoints, including store mirror clings and handouts inserted into shoe boxes to encourage customers to share their visual content. We want customers in every channel to be aware of our social media activity so we work closely with store partners to ensure that shoppers know they have the opportunity to join in the conversation, explains Wagner. Customer-generated imagery creates a richer omnichannel experience and a pipeline of visual content to spur additional conversions. Bazaarvoice Ratings and Reviews complements Curations on the DSW website. A challenge for any online retailer is the missing in-person ‘try on’ element. Letting customers read reviews on how a shoe fits or feels along with seeing customer photos for style, fills that gap, says Wagner. The combination of text reviews on key elements like fit and comfort, coupled with the style inspiration from visual content, leads to increased consumer confidence. The two types of content overlap in their overall purpose. A shopper might be looking for a shoe for a nice occasion and see that a particular sandal has reviews saying it’s comfortable. That checks off one box in their buying decision. Then looking at the Curations content and seeing other customers wearing the sandals in certain styles, checks the other box, explains Wagner. The combination of Ratings and Reviews with Curations acts as a force multiplier, increasing overall responsiveness to consumer-generated content. Millions of visitors viewed the two types of content, those who did were more than twice as likely to buy than those who did not, which resulted in a doubling of the revenue per visitor. One of the Digital Team’s main strategies is bringing DSW’s assortment to life. Having more lifestyle photography and ‘how to wear’ information from consumer-generated content increases customer confidence and drives conversions, says Wagner. DSW is a retail chain destination for brand-name and designer shoes, handbags and other accessories across its more than 500 stores in the United States. Our customers have been asking for more on-the-foot photography, more style guidance, more ‘how to wear’ kind of content.